The dimensions are 50" long, 24" wide and 4" deep. It weights less than one pound and it is roomy enough to hold multiple bowls dishes, drinks and cans for an remarkable party. CONVENIENT - Keep food and drinks cool and fresh for hours by filling ice into it. This serving bar is convenient, inflatable and portable. DRAIN PLUG - Yes! There is a drain plug at the bottom to easily remove extra water if you need to refill with ice. The drain plug is located at a corner so you can slightly shift the bar off the table and drain into a bucket. PARTY DELIGHT - This is such a NO-BRAINER for a great and fancy party! 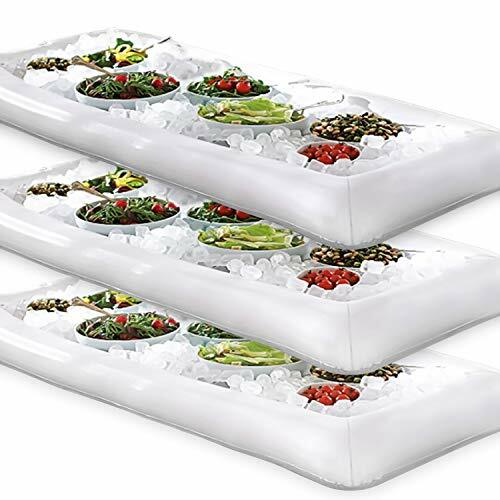 Definitely float it on the pool if you are throwing out a pool party. An excellent addition to any indoors and outdoors summer party and impress your guests. SPECIFICATIONS - The dimensions are 51" long, 24" wide and 4" deep. It weights less than one pound and it is roomy enough to hold multiple bowls dishes, drinks and cans for an remarkable party. GUARANTEED - GUARANTEED - Novelty Place is proud to have you as our customer. If your purchase is unsatisfactory in any way, you are covered with our FAST free replacement guarantee! Feel free to contact us! Large salad bowl. Mixing bowls. Bamboo bowl with serving spoons and dressing tray. Serving bowls. Prep bowls. Fruit bowl. Mixing bowl set. Wooden basket. Salad bowl set.